Quantum Physics can get really weird. You've got electrons popping into and out of existence, moving from one place to another without going to points in-between. You've got particles matching spin without physically interacting with one-another. You've got cats that are both alive and dead at the same time. Ok, so that last one was just a bit of a thought exercise in order to try and describe particles that can be potentially in two states, but you'll never know unless you directly observe them. But then, observing a situation can chance its state, according to other parts of quantum physics. It's all kind of confusing. But hey, we get a cute game about dead cats out of it. So there's that. 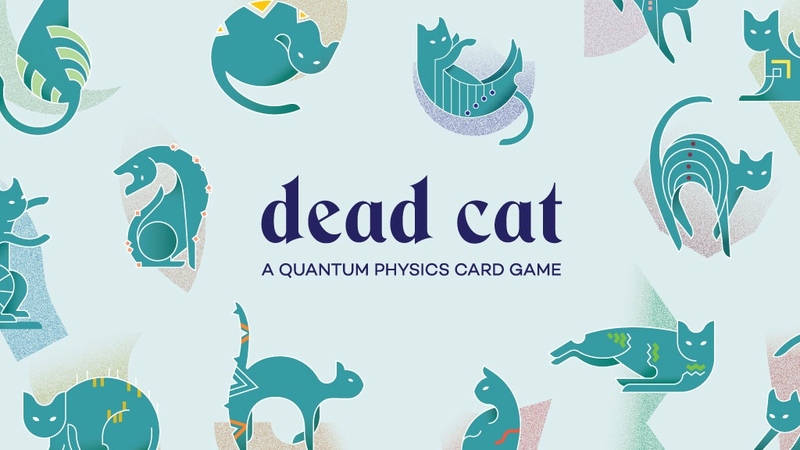 Dead Cat is a new, quick-playing card game that's up on Kickstarter now. Players are assistants in Dr. Schrodinger's lab. The good Dr. has brought in a cat and put it in a box. The assistants are all trying to guess if the cat remains alive or if it's dead. However, you can sneak a peek into the box and see how the little fella is doing. You do this by drawing a card from the top of the cat and looking at it (secretly) and placing it face-down on the discard pile. You then "bet" how long the cat is alive using your die. At some point, someone will claim that the cat has died. Players will then take the discard pile and turn it face-up. You'll count out how many cards are there before you reach a Dead Cat card. The player who bet closest to that number is the winner of the round. Play then starts again and goes until someone has won 4 rounds. The Kickstarter campaign is running now. It's set to go for another 28 days.